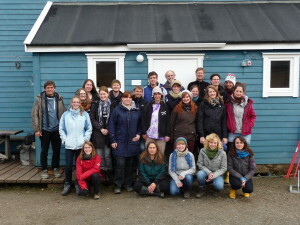 In den letzten acht Tagen hatten wir eine Studentengruppe der Uni Bremen und der Uni Kiel zu Besuch in Ny-Ålesund und an der AWIPEV Station. Kai Bischof und Wolfgang Bilger waren schon einmal, vor gut 10 Jahren, mit einer Studentenexkursion hier, und hatten entscheiden wieder zu kommen. Die Studenten hatten somit die Chance die Arktis um Longyearbyen und Ny-Ålesund zu erforschen und kennen zu lernen, und einen ersten Eindruck der Forschungsgemeinschaft auf Spitzbergen zu erhalten. Aber seht selber, was die Studenten hier in Ny-Ålesund so erlebt haben. 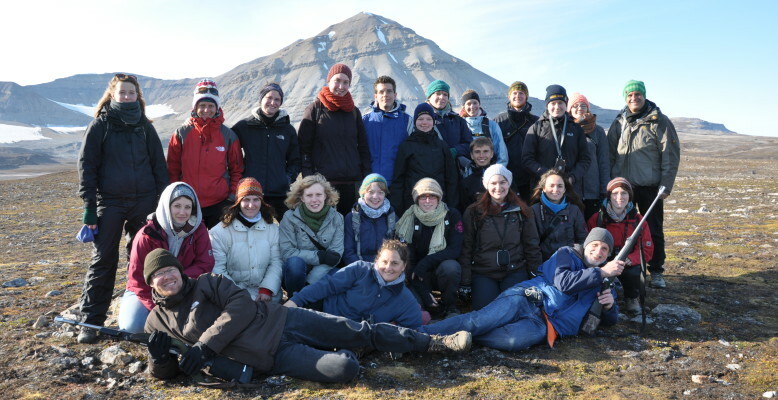 After a long journey via Oslo and Longyearbyen we – twenty students from the universities of Kiel and Bremen – arrived in the northernmost settlement on earth: Ny Ålesund. 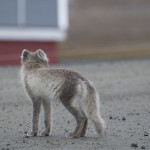 For most of us, our 8 days stay was the first encounter with the harsh arctic environment and an unforgettable experience. The days were packed with an exciting mixture of activities. We visited research stations, explored the rugged landscape, performed small research projects and ate incredible amounts of delicious food. At the AWI atmospheric observatory we saw how Kathrin Lang and René Bürgi launched weather balloons 35 km high into the stratosphere to improve our daily weather forecast. The other day we visited one of the most conspicuous buildings in Ny Ålesund: the radio telescope of the geodetic observatory. Moritz Sieber listens to waves from quasars – most distant objects in space – to check our position on earth. Together with colleagues from all over the world, he can pin down objects with one centimeter accuracy. His gravimeter is so sensitive, that it spiked when the snow was shoveled from the roof in spring. Edoardo Calizza (Sapienza Univ. of Rome), an enthusiastic Italian scientist exploring Arctic ponds, gave us hands on lessons at Solvatnet. For him goose droppings are worth their weight in gold as their isotopic signatures elucidate the structure of the pond`s food web. 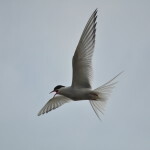 To assist him, we collected goose droppings by size and colour, sampled tadpole shrimps and water fleas, cut feathers and fought with arctic terns. Boat tour around Blomstrand with Blomstrandbreen in sight. The boat-trip to Blømstrandbreen with Thomas Ribeaud, Kathrin and René was a highlight. In the last 30 years, this glacier has retreated rapidly, exposing an island previously believed to be a peninsula. Now, more than 1 km of iceberg filled water separates the island from the glacier`s edge. On the return we were lucky to see a polar bear with its cub! Although for oceanographers the Kongsfjord is merely subarctic it definitely was cold enough for us. In an altruistic action we tested the survival suits of the AWIPEV-Station by floating through the harbour. 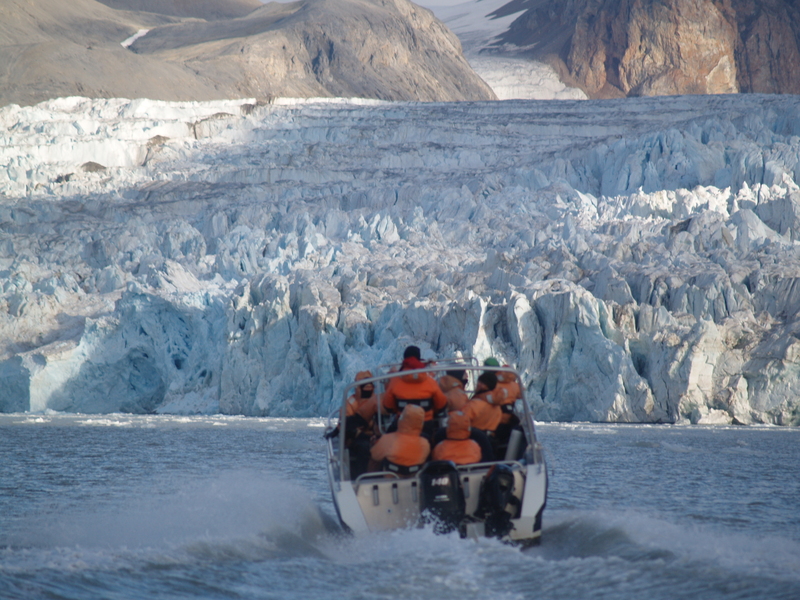 The icy water of the fjord allowed to detect even the smallest leaks in an instant. 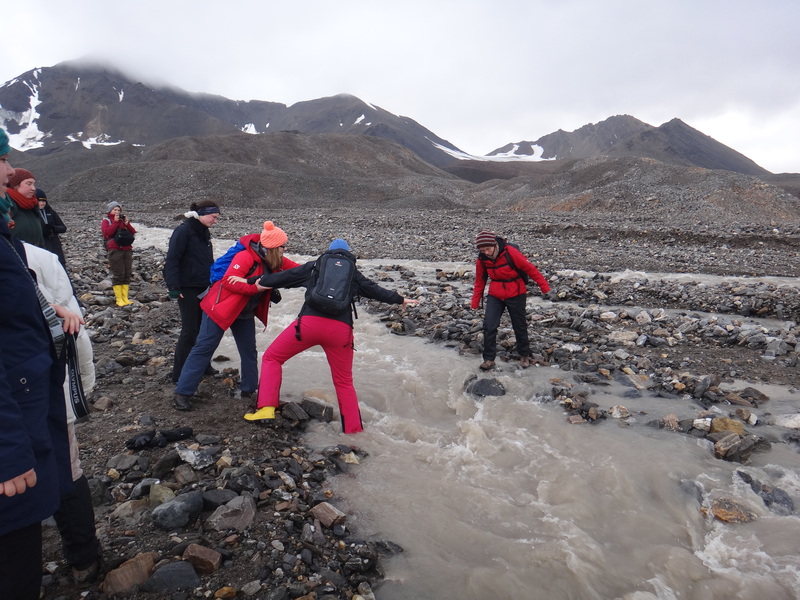 We visited a second retreating glacier on foot, building bridges wherever glacier runoff was too wide to jump across. We investigated the colonization on the freshly exposed surface. 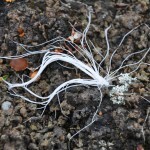 The first plants grew 120 m from the glacier´s edge between gravel exposed 10 years ago. Even after one hundred years, vegetation did not exceed the small cushions, crusts and fungi. Some fungi were so bizarre that our professors did not recognize them as such on first glance but confused them with shed reindeer hair. 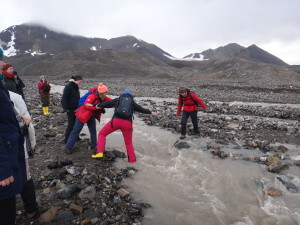 Crossing glacier streams can be challenging. 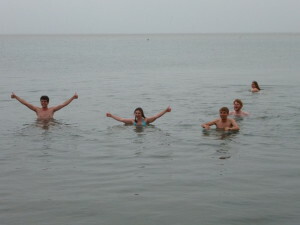 We searched the fjord for animals and algae, turning rocks in shallow water and venturing as deep as we dared. Max, Maurits and Anke, the research diving team of the AWI, helped us by collecting samples at greater depth. Thus we discovered a wealth of strange species such as red sea squirts, giant amphipods and sea spiders whose body consists of legs only. Skeleton shrimps (Caprella septentrionalis) cling to delicate branches of the brown alga Chordaria flagelliformis to hide from predators and curious students. We measured underwater light, hunted plankton and monitored algal photosynthesis. In sum, we found that the fjord offers numerous habitats due to glacier runoff, sediment plumes and different substrates. We enjoyed our time in Ny Ålesund and meeting the great people living here. Nature and high-tech do not collide as in other places, but co-exist in harmony. Open doors and open minds, heavy rain and heavy drinking, scattered debris and shiny high-tech make Ny Ålesund unique. Thanks to all people who supported our field trip! Vielen Dank für den ausführlichen Bericht. Es war spannend zu erfahren und auf den Fotos einen Eindruck davon zu bekommen, was mein lieber Sohn so macht. Ich wäre gerne dabei gewesen und Oma Rita auch! Nun ja auf jeden Fall machen wir nächsten Sommer wieder eine Kanutour durch Finnland! Toll, dass ich durch eure Infos so mit dabei sein konnte. Macht weiter so!